Matur Maker and Makur Maker played well at a recent club competition in France. Toronto (heinnews) – Matur Maker and his cousin Makur Maker recently played at a tournament in France and passed the test against European clubs with flying colors, according to their guardian/advisor/coach Ed Smith. 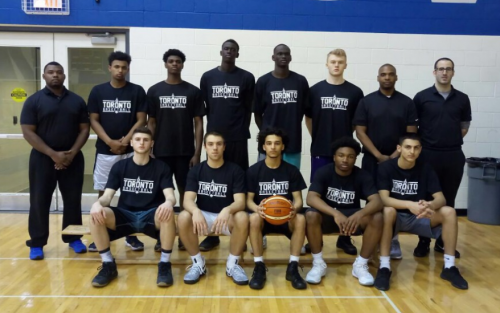 The Makers were part of the Toronto Basketball Academy team that went to the Cholet Mondial Basketball tournament in Cholet, France from April 14-17. The annual event featured 12 teams from six different countries – Brazil, Canada, Czech Republic, France, Germany and Italy. The Makers’ teammates on the squad were Rahsaan Chambers, Adham Eleeda, Kahleel Ellis-Garcia, Amir Gholizadeh, Scott Hitchon, Jamal Mayali, Jimmy Rich, Zubair Seyed and Carl Veltmann. And the team went 2-3 in the five games, despite having hardly no practice time together since the Makers had been competing in the BioSteel All-Canadian Game just days before the tournament in France started. Matur Maker averaged 14.8 points, 6.8 rebounds, 2.2 steals and 0.8 blocks while shooting 35 percent from the field. Makur Maker collected 6.0 points, 5.2 rebounds and 0.8 steals and hit 38 percent from the field. “My thoughts were that the team would be well coached (by Canadian U19 national team coach Roy Rana) and that it would be an opportunity for Matur and Makur to be exposed to European style of play and FIBA referees,” Smith said. Smith wanted to use the tournament to gauge several factors in the Makers. Smith said Matur, who was born on January 1, 1998, surprised him with his performance in Cholet. “I was very surprised at how easily Matur got to the basket against both bigs and guards and finished through contact or drew the foul. I truly believe the referees began to swallow their whistle as the game would progress because of the level of his effectiveness. Teams began to cushion his drive and I felt that an area to continue to work on is the 17-foot catch-and-shoot or jab-and-shoot and the pull up off the bounce. Smith also said Matur is understanding how to take advantage of situations. Is Europe next for Matur? There has been talk that Smith may send Matur to play professionally in Europe instead of going to college in the United States. He addressed that contemplation briefly as well. “I realize that playing in Europe, talent wise, Matur would excel. Finding the right coach, adjusting to the playing style, the language barrier, the strength and conditioning, and being away from family and friends are important variables to consider,” Smith said. In regards to Makur, Smith was very pleased with the young Makur, who was born on November 4, 2000 and thereby nearly three years younger than the rest of the competition. Smith said he is really looking forward to continuing his work with Makur, who was named co-MVP of the BioSteel All Futures Game. Smith said it’s “scary” to consider Makur’s athletic package even though he hasn’t started lifting weights yet. He said Makur should easily be able to carry 240 pounds and not lose his athleticism. Makur better than Thon or Matur? Smith also described some of the talk at the BioSteel Futures Game regarding Makur’s future. “There were whispers that this might be better than Thon and Matur down the line. In order to get into that conversation, Makur will have to play every possession with passion,” he said. 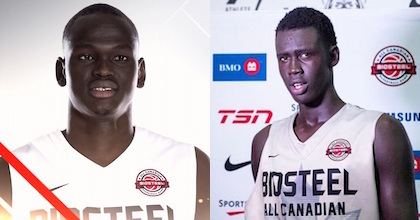 None of the trio of Thon, Matur or Makur have played national team basketball yet. All three were born in Sudan and could in theory play for Sudan or South Sudan. But Smith said Australia is the much more likely option. Matur Maker missed a chance to play at the FIBA U18 Oceania Championship 2016 last December, when New Zealand beat Australia to qualify for this summer’s FIBA U19 Basketball World Cup – leaving Australia on the outside looking in at the U19 spectacle for the first time in history. With Makur Maker being born in 2000, there is the FIBA U17 Oceania Championship this year from which the top two teams qualify for next year’s FIBA U18 Asia Championship. It would take a miracle for anyone in Oceania to beat either Australia or New Zealand to make the U18 Asia competition. The top four teams from the FIBA U18 Asia Championship 2018 will reach the FIBA U19 Basketball World Cup 2019 – meaning Makur could play for Australia in either the continental or world competition. But that remains to be seen.